Painter and Lucas Artists Residency Fellow Nicole Schmoelzer presents a collection of new works in the Project Space Gallery at Montalvo Arts Center, in a solo exhibition entitled Seeing Light. Schmoelzer, a native of Switzerland, has always been interested in light and the ideas of luminosity, brightness, and transparency. This focus is central to understanding Schmoelzer’s body of work, which continuously offers compositions of brightly colored abstractions that derive from layers of paint upon a single surface. 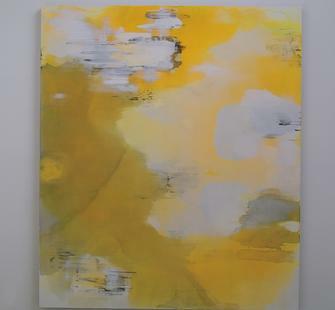 Since arriving at the Lucas Artist Residency Programs in mid-January, Schmoelzer has been creating a series of works on canvas and paper that reflect the changes in the California light that have captured her throughout her residency. The environment of Montalvo has led to new experimentations in her work as Schmoelzer has not only paired colors in new ways, but also investigated the contrast between light and dark, allowing more grey and black to inhabit her compositions. These new works still feature her vibrant colors and signature style of complex paintings that result from layers of ink, oil, and watercolor on one surface.